JACKSONVILLE, Fla. – Ancient City Con will be taking place at the Prime F. Osborne III Convention Center, from July 15 through July 17. The convention will be based around science fiction, gaming, music, cosplay and fandom. Hours of operation for Ancient City Con will begin at 12 p.m. on July 15, 8 a.m. on July 16 and 8 a.m. on July 17. The dealer’s room hours will be from 12 p.m. to 7 p.m. on July 15, 10 a.m. to 6 p.m. on July 16 and 10 a.m. to 6 p.m. on July 17. The convention director is Christopher Gabaldon. 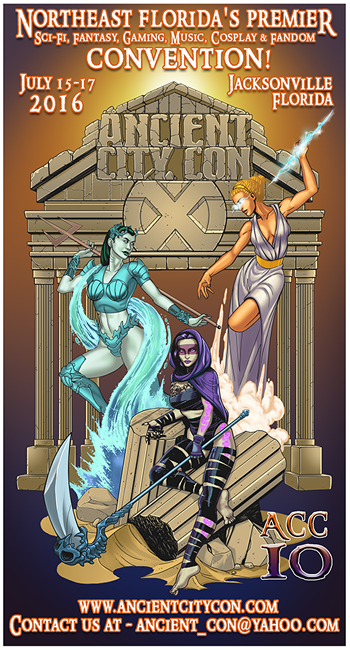 In 2007—Ancient City Con formed in the city of St. Augustine, Fla. and it was a one day event. The program of the convention was operated by the fans. Since moving north to Jacksonville, it expanded to a three day event. The demographic it reached were fans of: anime, art, contests, cosplay, discussion panels, fantasy, gaming, horror, independent film screenings, literary and publishing, sci-fi, nerdcore musicians/bands, special guests and more. Every year, they strive to bring something new. Charity organizations, cosplayers, fandom club, guest performers and panelist members of Ancient City Con include: 501st Legion, Akrcos, COO-IE, Cowford Steampunk Society, EXTRA-LIFE.ORG, Jacksonville Ghostbusters, Jamie Pearce, Jedi Academy of North Florida, Kilter Creature, Miss Fushi, Roadrunner Cosplay, Rocky Sawyer, Ruby Rapture and Southern R2 Builders Group. Authors who will be present at Ancient City Con will comprise of: Ashley L. Grapes, R. J. Jojola, Sandra Leigh, Pearce, Winfield H. Strock and J.A. Sutherland. Music artists will feature: DJ Conwright, Lilith, Noise Complaint, Sci-Fried Band and Zorigami. Activities scheduled for Ancient City Con consists of gaming tournaments, tabletop gaming, LAN party, video gaming and discussion panels. Contests taking place comprise of miniature painting, costume and cosplay. Few slots are left for registration to be part of creator’s alley, dealers, game master and panelist member. Those wanting to register and be part of the convention are advised to fill out the forms via their website. Sponsors of Ancient City Con are moviecrypt.com, Coo Interactive, Impudent Mortal, The Amplified Dojo, Borderlands Comic and Games and EWM82. For the complete list of pricing for tickets to the weekend event, please visit their website. To visit Ancient City Con’s official website, please click here. Like them on Facebook, by clicking here. Click here, follow them on Twitter. Subscribe to their YouTube channel, by clicking here.